Villa Portakal is a spacious villa suitable for a large family or more than one family to enjoy a relaxing. Villa Portakal is a spacious villa suitable for a large family or more than one family to enjoy a relaxing holiday. 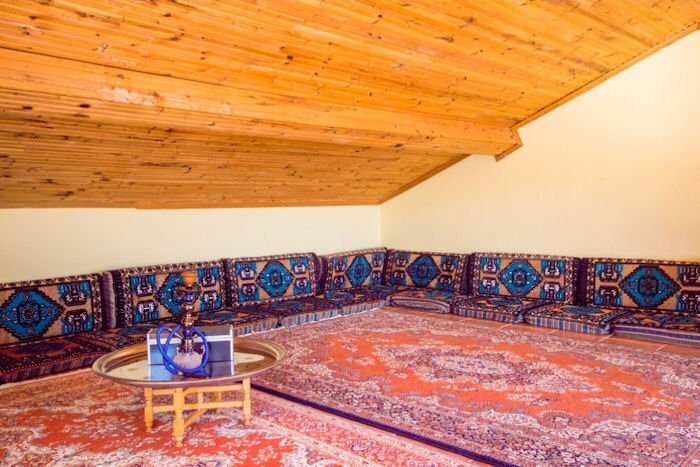 There are 5 large bedrooms all with air conditioning and also a large Turkish room on the top floor authentically furnished in the Ottoman style which can be used as a chill out room or an extra bedroom. The villa has a spacious living area with plenty of facilities for relaxing. There are balconies to all the bedrooms and a spacious roof terrace with breath-taking views of the turquoise sea. The villa is set in a quiet area of Kalkan only a short walk from the town centre and is ideally situated for visiting Kalkan 's weekly market for a bit of bargain hunting. The local supermarkets are a 5 minute walk away and the old town and harbour are a 10-15 minute stroll. The villa luxuriates in its own garden with a large swimming pool on an extensive terrace with a shady timber and cotton pergola if a break from the sun is required when it's getting too hot! Private swimming pool, sunbathing area, sunbeds, umbrellas, BBQ, outside furniture, outdoor shower and dining area. The pool size: 9m x 4m, Depth 1.6m. Kitchen is fully equipped - cooker, hob, fridge, freezer, dishwasher, microwave, toaster, kettle, and gas hob. Living room area has plenty of comfortable seating, LCD TV, DVD player, satellite TV channels and unlimited internet access. The dining area seats 10 guests. 2 Patio doors lead out on to the pool terrace and fantastic views. Bedroom 1 is en-suite twin bedroom with air-con, wardrobe, and vanity unit. There are lovely balcony with spectacular natural and sea views. Bedroom 2 is en-suite double bedroom with air-con, wardrobe, and vanity unit. There are lovely balcony with spectacular natural and sea views. * Bedroom 5 is en-suite twin bedroom with air-con, wardrobe, and vanity unit. There are lovely balcony with spectacular natural and sea views. Rising up from the shore you will come to the Old Town of Kalkan, with narrow cobbled streets home to an array of shops selling Turkish wares from shoes to spices, ceramics to clothes, handbags to hand crafted souvenires. Originally a Greek town, the ambience does not let you forget this - as the sun goes down the twinkly lights on the rooftop terrace restaurants illuminate offering you fantastic views as you dine. Kalkan has a small but pleasant beach only a few minutes’ walk from Villa Portakal. Or, on the Western side of Kalkan, is Kalamar beach, which has a beach club and a couple of waterside restaurants to choose from.